How easily are you influenced by other people’s style? I find the more I’m exposed to someone’s style the more likely I am to be inspired to create my own version. As a style blogger I like to change up my style often just to keep things interesting. This includes learning how to wear a bathrobe as a jacket. Please note: I’m not talking about wearing your PJs to the grocery store. Someone please explain to me what is so difficult about putting on pants before one leaves the house. A person that lazy must be well versed on wearing adult diapers just to avoid the whole hassle of visiting the loo. No, I’m talking about taking a fancy robe and wearing it as a long jacket à la Super Star Melanie. Another version of the same bathrobe but now with some movement to show off just how unexpected and cool this look can be. 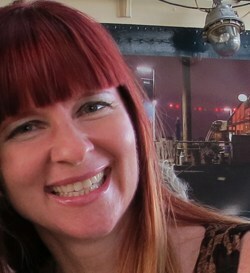 Looks great on a delicate waif like Melanie right? I will now share with you what happened when a decidedly curvy gal tried to layer up a silky bathrobe and prance around like a celebrity. Did I swallow a whole other version of myself? Maybe I was about to have a miracle baby! Perfect since I don’t need to change my clothes to go to the hospital. I took the photos at the worst time of the day and in partial sunlight. That is the sun letting me know my chest and the rest of my massive self is visible from outer space wearing this. I thought adding snaps to the robe just below the chest would help to cinch things in a bit. Ha ha! NOT! Instead it brought the focus straight to the treasure chest. The fabric falls straight down from the chesticles visually adding a good 80 lbs to my frame. Just what I wanted! The idea of layering yet another piece on top in the form of a lace vest seemed so wonderfully Matryoshka (AKA Russian Nesting Doll) but as you can see went totally sideways to heavyweight French opera singer tries desperately to do boho. Peel off a layer and open up the robe. See? I wasn’t hiding a mini me under there after all. And the look from the back is very swishy. I have another version wearing this bathrobe as a dress that I’ll share with you soon. Very Keisha Girl. Would you ever consider wearing a bathrobe as a long jacket? So none of my bathrobes look like this—that would be my problem!! Mine is a terry cloth, super heavy thing (and my summer one is quite short). But in truth, no one would know this is a bathrobe….so of course you could totally get away with this. It really looks like a fabulous, long kimono!! Always – I have a collection of snazzy man robes, a beautiful varuna wool Liberty Hera robe (with a very worn collar but IT IS MAGNIFICENT so who cares), and a gorgeous Beckford Silk which is just LUSCIOUS (this one http://www.beckfordsilk.co.uk/shop/silk-dressing-gown-peacock – for not much on eBay). I got a handful of beautiful block print Anokhi and Indian cotton ones last year that layer up with my plain velvets. Like your long knit vest – wear them open (elongating) and roll the cuffs – then swish the eff out of the day – your own wind machine or fan-wielding minion optional 🙂 I even have a couple of vintage mohair plaids that are warm enough to wear as coats. You look fab – bang a fedora on and a bit of fringe and … ta-daa … you’ve got boho luxe ! WOW. I adore that robe!! Those sleeves! The pattern! Once you get feel the swish, you’re addicted, right? I think this looks incredible on you, the open version with the swish of course, although your first styling would still swish when you walk with only one closure. Thanks for showing me my man robe again. Heh. It’s space bagged. I better get it out again. You look awesome and inspire me to go digging. I love this stylish look! Unfortunately, my bathrobe-chic would be more like bag-lady-chic. Picture my old faithful bathrobe, washed out, stained with hair dye and a total disgrace. It is neither chic nor elegant. I would look like I had finally flipped if I stepped out of the house in mine. If I had your though….hmmmm….try and stop me! I’ve got a pretty kimono-as-bathrobe somewhere around my nest. (You don’t want to know what I usually trapse around the house in). Would I wear it out and about? Oh you Canadian girls and your beautiful bathrobe coats!! So very swishy. “Would I consider wearing a bathrobe as a long jacket?” Yes, if it was that bathrobe, and I would love it. it looks like it would feel great. So much fun. I don’t know what kind of long jacket is on Rita, but it looks great. 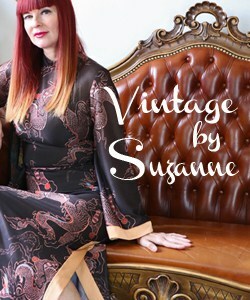 And, the robe-as-jacket is perfect on you, Suzanne. Especially when it’s open and flowing. Still laughing about the very funny article, by the way. Hmm…I don’t own a pretty bathrobe, so that’s problem number one for me. Love how you transformed this look by opening things up! So gorgeous, you are! First, you have to have a “Bathrobe” that is lightweight and as beautiful as that one! See, all you had to do was open it up, and wear a fitted underlayer, just as you did with the floral short kimono. I love a coat with good swishy factor! If I could find one as gorgeous as yours then hell, yes! It looks utterly fabulous over your distressed skinnies and fabulous jewellery. If I had a dressing gown as fabulous as yours then hell, yes!! Love the distressed jeans, your trademark bling and beret. Lovely photos and such a brilliant idea! I have a totally fab satin robe that would be wonderful as you suggest. However, as the only fashion blogger on the island, the notion of stepping in out in something intended for my boudoir might be seen as taking things a bit too far. They’ve not stopped talking about that flashy red underskirt yet! it’s an amazing piece, so beautifully printed, love those floral motives!, and it looks gorgeous on you when you wear it open, showing your pretty figure!. 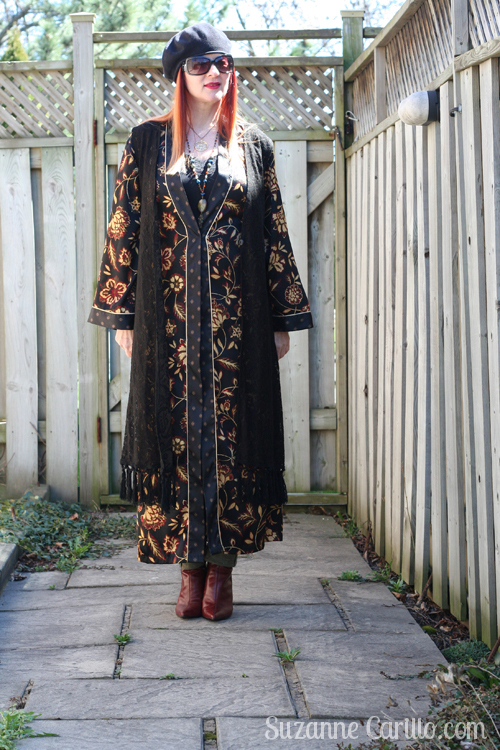 I’m a huge fan of floaty robe-like clothes, even if I’m curvy (and plus-sized! 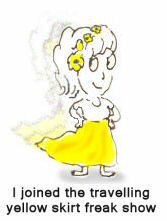 ), so I going to stay wearing all my long tunics, 80’s overcoats, and beachrobes! You look gorgeous! 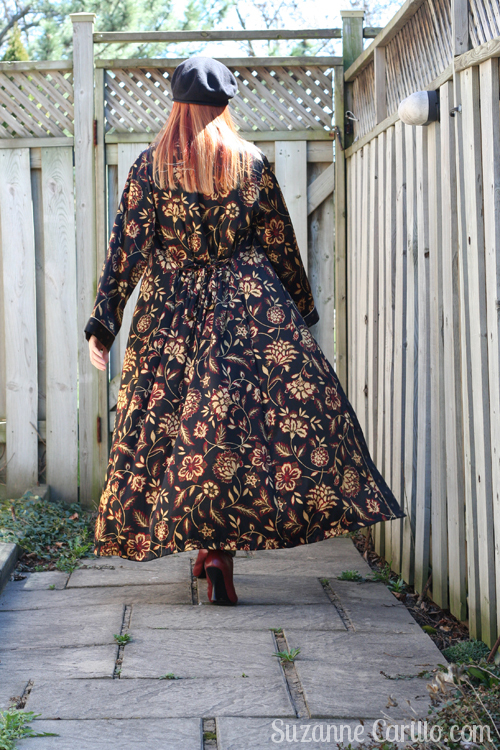 and love how your robe looks backside when you walk! YOU rock this look Suzanne, but then again, you rock everything you wear! You dare to be daring and you do it with style. I couldn’t get away with it. I’d feel like I’m trying to look like … a … a lady wearing a bathrobe. Would I ever consider this? If it makes me look like you or Melanie in a bathrobe…?? Yes I would. Someone gifted me a vintage Asian robe, and I’ve never been quite able to figure out how to wear it- but now I have some ideas! It is so interesting to me how just those few changes really changed that outfit from something “gone horribly wrong” to a super chic bourgeois look! You look soooo cool with it opened there! I tried leaving a comment and then the internet went out so now I’m mad. So there. Poo. No comment for you. Oh wait… this is a comment isn’t it? Kind of. I had to stop by and check out this version of the public bathrobe…I think this is my favorite. I love it belted as a dress, but I’m totally diggin’ the cool girl vibe it throws off when it’s open and flowy. And I agree that if it’s not belted, open and flowy is definitely the way to go.